On the morning of Sunday 26th September 2010, most of the Karno Company descendants from the previous day, plus a few additional ones, and some invited guests, assembled outside Fred Karno's Fun Factory, to make the journey to Hampton. It was a trip Fred Karno himself would have made many times. The prize awaiting us was a guided tour of Karno's former houseboat - the "Astoria." After some generous hospitality from our hosts, we were taken in small groups aboard this magnificent vessel. The 'Astoria' was built in 1911, and no expense was spared, with the finest imported wood, lead crystal windows, and opulent decor. The new owner, too, spared no expense on refurbishing it. A new wooden hull, set inside a metal hull, took care of many thousands of pounds, but will ensure that the 'Astoria' stays afloat for at least another hundred years. Access to the mooring is by a tunnel, built by renowned architect Capability Brown, who went on to landscape all of the surrounding embankment. of the man he is currently researching - Fred Karno. Thames from the observation deck of the Astoria. The combination of the magnificent boat, the picturesque surroundings, the warm hospitality, and the assembled company made it a truly magical experience, and one which will linger long in the memory of all those who were privileged enough to be invited there, for which we can't thank our hosts enough. 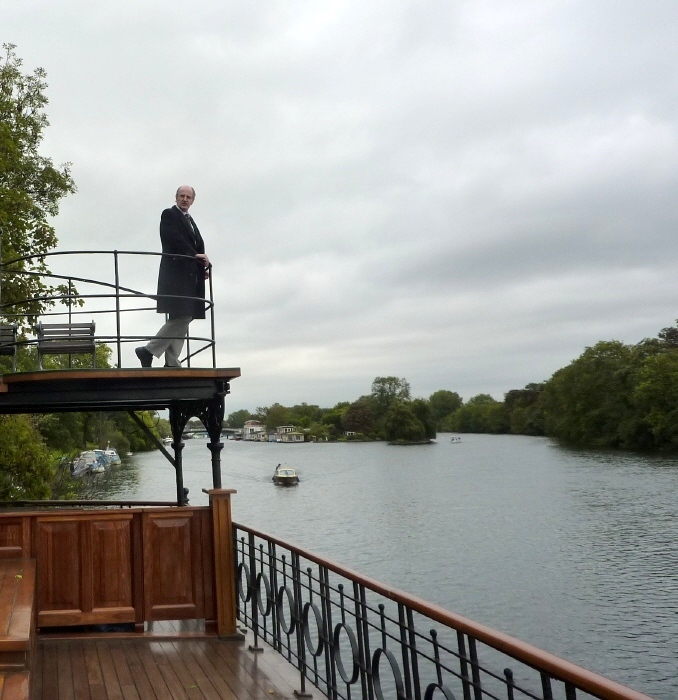 From the 'Astoria,' our company were skiffed along the Thames to a nearby eatery, overlooking this historic river. Enjoying good food, in good company, while watching swans and river craft majestically sailing by, brought our Fred Karno Centenary weekend to an atmospheric ending, and everyone left with contentment at having commemorated in style, the 1910 Karno Company.